Casio might have a solid G-Shock line that has stellar good looks designed to withstand mechanical shocks, but that doesn’t mean that its very own classic range of watches should be completely outshone by its contemporary counterparts. Here to prove this point is Casio’s Vintage Digital Watch collection that has been recently updated with all-new designs. A trio of watches that come with silver-tone stainless steel bracelets with differently coloured watch faces between the three. The A168WEM-1 comes in Black, the A168WEM-2 in a bright Teal and the A168WEM-7 is simply done with tone-on-tone Silver. 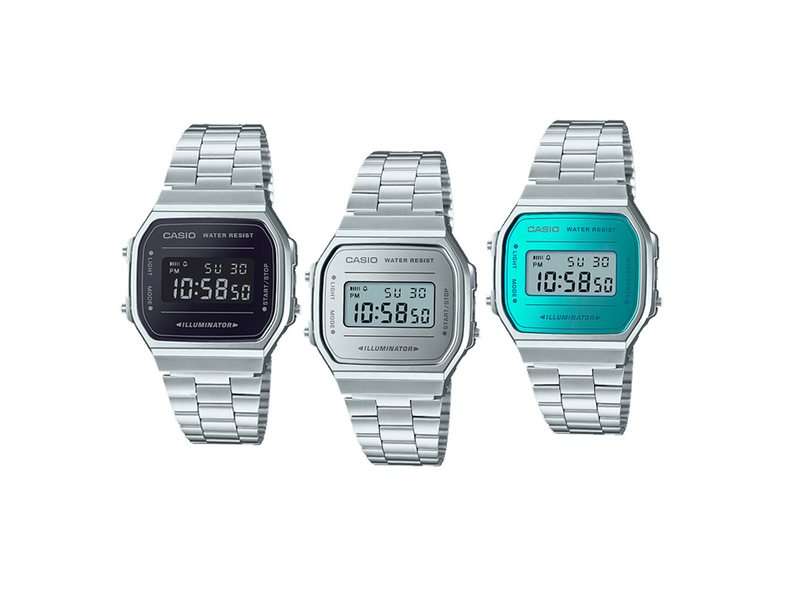 All three are priced at USD49.95 and feature classic Casio functions like a built-in alarm, 1/100-second stopwatch, as well as electro-luminescent backlight with sporty yet classic good looks that’s truly versatile. Do stay tuned for updates as we continue to source for these stainless steel versions online, but if you do want in on the action right now, here are two others under the A168W range that’s slightly similar, either in Gold or Rose Gold and are priced at SGD125 each over on ASOS.